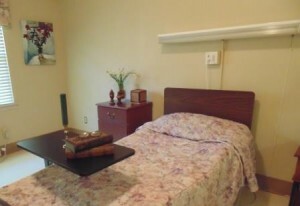 Accommodations in our facility include 4 private rooms and 48 spacious semi-private rooms. Free Wi-Fi is available in the resident rooms and public areas of the facility. Cable/telephone available in each room with the resident responsible for monthly charges direct to phone and cable company. 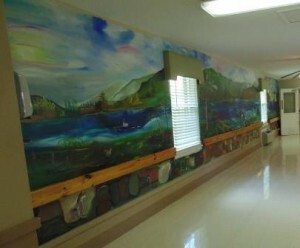 Rivers Edge Nursing and Rehabilitation Center has many areas for residents to relax or participate in many of the activity programs available. 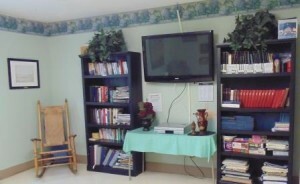 Several areas have TVs which can be used by all of our residents. The activity department keeps us well entertained with games, a slot machine, books, puzzles, Wii games, movies, radio, CD’s, arts and crafts supplies. 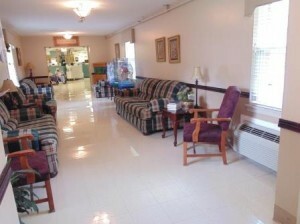 Our common area walkway has comfortable couches for visiting. Enjoy the birds, fish and outdoor cats, if you are an animal lover or watcher. 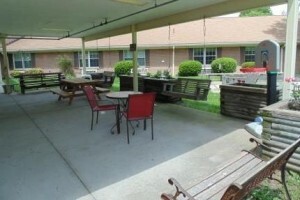 Our spacious patio is a great place to enjoy the outdoors. The facility has a designated smoking area for residents. This beautiful mural leads the way to our dining room. We want your dining experience to be enjoyable. Like to sleep late? That’s okay. We serve meals at a time convenient to your schedule not ours. Pick the time that is best for you. We have selective menus where the residents make their own choices from the regular menu or the available alternative selections. The activities department offers several activities each day. 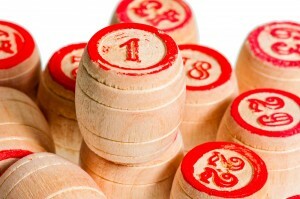 These activities include Bingo, religious programs, music programs, social events, special events, sensory stimulation programs, exercise programs, educational programs, and parties. We also go on several outings each year. They can range from going to restaurants and movies or shopping to attending the Kentucky State Fair.Our residents love going on these outings during the year. They enjoy coming back talking about how much fun it was. These activities stir memories and spark conversations. Residents tell stories about their family memories, where they worked and what they did for fun when they were at home. 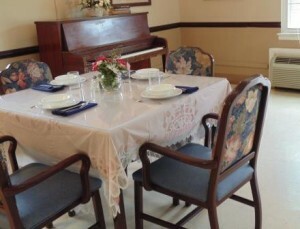 In addition to the many activities we offer, One-to-One and in-room visits are conducted daily for residents who cannot participate or choose not to participate in the daily activity program. We hold monthly birthday parties for our residents.